Where does violence start, and where does it end? Does it begin and end in the precise moments of a violent act itself, or is the history, experience and bad luck that's led up to that decisive moment all that matters? And what happens after the conclusion of a bloody act? Blue Ruin - writer, director, and cinematographer Jeremy Saulnier's second feature - is an impeccably crafted low budget genre piece that deconstructs the hoary old tropes of the revenge thriller with unconventional wit, while taking a demystified and humane look at the consequences of violence that brings to mind such singular work as Unforgiven and No Country For Old Men. It's Blue Ruin's unconventional choice of protagonist that makes it such a distinct and effective film. Saulnier's childhood friend Macon Blair stars as Dwight, a homeless drifter living out of a rusted old blue Pontiac adorned with unexplained bullet holes. He ekes out a meagre living on the Delaware coast digging through trash for food, and breaking into unoccupied houses in order to bathe. His wild appearance and haunted eyes suggest a man long broken, forced to go through the motions of existence. We quickly learn the source of his trauma - his parents were killed years ago, and their killer is set to be released from prison. From that point on there's no looking back, as he sets out to kill the man that ruined his life; the imminent spiral of violence seemingly decided long ago. Yet Dwight isn't Liam Neeson, he doesn't have a very particular set of skills. He's a man of action in the sense that he's compelled to exact vengeance, and able to stifle his very apparent and justifiable terror long enough to carry out his half-thought through and frequently brutal plans, but beyond that he doesn't have the faintest clue of how to go about his business. The film resembles No Country For Old Men, and indeed the work of Cormac McCarthy in general, in its meticulous focus on the procedure and practicalities of carrying out violence. But it's made particularly unique through Dwight's lack of experience, and the film's consistent commitment to having real world logic infringe on what would otherwise be standard revenge movie beats. We've seen plenty of action heroes grimace while doing a spot of DIY healing after a fight gone bad, but when Dwight tries to sort out an inconvenient arrow lodged in his leg, things take a darkly humorous and entirely plausible turn. While the film is interspersed with moments of bone-dry black humour, it takes its hero seriously, unlike for example some of the Coen brothers' more hapless and buffoonish protagonists. As ill-equipped as he is, Dwight never succumbs to horror movie idiot logic. There's always some sort of readily apparent but frequently misguided rationality to his desperate manoeuvrings, and every bad decision snowballs into the next confrontation, ruthlessly propelling the plot forward to an inevitable and bloody reckoning with the fallout of Dwight's eye-for-an-eye mentality. This is a mercilessly lean and efficient film, clocking in at under 90 minute - a rare genre treat in light of the bloated big-budget dreck Hollywood keeps churning out. Dialogue is kept to a minimum, but the few interactions Dwight does have with friendly faces leave a lifetime's worth of regret implied without ever having to spell anything out. Thankfully Macon Blair's twitchy, haunted performance does more than enough to maintain interest for the long stretches of tense action. Visually too it's a gorgeous, elegantly shot film, all the more remarkable for having been made on such a shoestring budget. Saulnier had been working for years as a commercial filmmaker, while also gaining experience and success working as a cinematographer on the indie projects of his friends. Blue Ruin was paid largely out of his and his family's own pocket as a last ditch stab at making it on his own as a director. The limited funding was also supported by a successful Kickstarter run, showcasing the potential of crowd-funding to support unique original work. Some may find Blue Ruin to be a little too sparse and economical, and there are aspects that could have been elaborated on. The villains are all rather thinly sketched and outright monstrous for the most part, and a little more shading could have given an even more ambiguous edge to the already sickening violence we see our hero carry out. These minor points don't detract from the effectiveness of the whole, however. 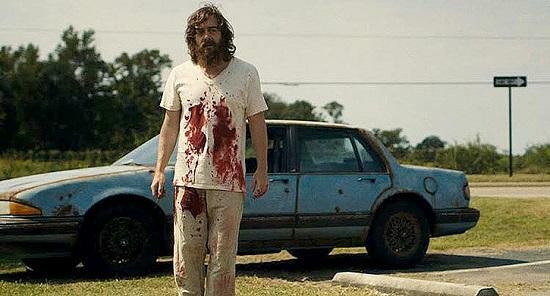 Blue Ruin is still a relentless, brilliantly acted, razor-taut thriller, which leaves you with a disquieting aftertaste. Most revenge tales have a half-handed and hypocritical moralising element to them, but violent retribution has seldom felt as small and ugly as it does here.